Sky Blue Credit Repair has been a leader in fast, legal, and affordable credit repair since 1989. They are a BBB accredited service with a quick dispute rate and a condition-free 90-day 100% money back guarantee. Since 1989, Sky Blue has provided their customers with quick, legal, affordable, and accurate credit repair. Sky Blue is licensed by the State Attorney General's office and works with experienced credit repair specialists to dispute questionable items quickly and efficiently, at an average rate of 15 items disputed every 35 days. 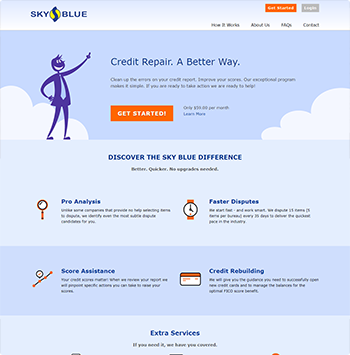 Once you provide Sky Blue Credit with your credit report, they identify and dispute any inaccurate information and email you a list of erroneous items, which can include collections, charge-offs, liens, loans, bankruptcies, foreclosures, judgments, late payments, repossessions, identity theft, and foreclosures. To ensure a quick and accurate process, Sky Blue keeps an open line of communication by emailing you a record of disputed items and sending dispute letters to the three credit bureaus (Experian, Equifax, and TransUnion) on your behalf. This allows the bureaus to send responses directly to you so you can see progress as it occurs in real time. If these disputes are not corrected, Sky Blue Credit will automatically resend them the following round to maximize results. Because of their speedy disputes, many of Sky Blue's customers can see around 45 out of 60 negative items removed after six months. However, you should note that each credit repair case is unique and your individual results may vary. In addition to their credit repair services, Sky Blue also offers extra services included for free), including debt validation, goodwill letters, debt settlement, and negotiation consultations. If you are not satisfied with their services, you can cancel anytime with no additional fees and be eligible to receive a 90-day money back guarantee -- the only condition-free guarantee in the industry. Industry accreditations: Sky Blue Credit is accredited with an A+ from the BBB. Close communication: They keep an open line of communication with you and allow you to receive emails directly from the credit bureaus. Wide range of removable items: Sky Blue Credit can remove collections, charge-offs, liens, loans, bankruptcies, foreclosures, judgments, late payments, repossessions, identity theft, foreclosures, and more. Fast, legal, and effective credit repair: After Sky Blue sends a dispute letter, credit bureaus have 30 days to process results, so progress may be seen in the first month. Further improvements can be seen for each of the following months you are enrolled. Extra services: Sky Blue offers extra services that include debt validation, goodwill letters, cease & desist letters, and negotiation guidance. Money back guarantee: Sky Blue offers a 90-day 100% money back guarantee. If you are not satisfied with their service, you can receive a full refund. Payment flexibility: Sky Blue allows you to skip a monthly payment if you have trouble with your budget. Customers also have full control of their billing dates. You can even temporarily pause your credit repair membership and start back up again when you are ready (with the click of a button in the membership panel). Great customer service: Sky Blue has experienced credit repair specialists who strive for transparency and professionalism. Extra credit assistance: Sky Blue reviews your credit profile and recommends personalized tips to improve your FICO® score. Additionally, they assist clients in obtaining their free credit reports, FICO® score, and credit monitoring. Sky Blue only provides a monthly payment option rather than an additional pay-per-deletion method. Sky Blue is the longest running credit repair service that we have reviewed -- they have been in business since 1989. Additionally, they are the only company with a completely condition-free 90-day money-back guarantee. The other companies we reviewed that offer 90-day money back guarantees (Credit Saint and The Credit Pros) stipulate refunds only in the case that zero items are deleted during the first 90 days. Sky Blue is also unique in the fact that they offer extra services such as debt validation, debt settlement, goodwill letters, and negotiation consultations at no extra cost, whereas other companies require a plan upgrade for extra services. Individual Monthly Rate: For $79/month, this plan provides bureau disputes and FICO score assistance. Couples Monthly Rate: For $119/month, this plan includes all of Sky Blue’s services plus a discount for enrolling a friend, family member, spouse, or roommate. How does Sky Blue compare to its competitors? Sky Blue is known for their speedy disputes and extra services, which include debt validation, debt settlement, goodwill letters, and negotiation consultations. A for-profit company must also accurately inform you of what they can and cannot do in addition to providing a written contract and allowing the contract to be canceled within three business days of signing. If you ask, a legitimate company will inform you that you have the right to fix your own credit. Companies that guarantee to erase bad credit or raise your credit score by a high amount very quickly is a red flag. Because Sky Blue follows all of these guidelines, they are a trusted credit repair service. Because of the CROA, no credit repair company can guarantee the removal of bad credit. However, Sky Blue is a reputable company and many clients report quick disputes and an increase in their credit score. What are Sky Blue Credit's business hours? Sky Blue is open Monday to Friday from 9 AM to 5 PM EST.